Ocean heat content, however, is in a unique position. The world’s oceans store over 90% of the heat in the climate system. Arguably, therefore, increases in ocean heat determine overall global warming. Ocean heat represents the physical bulk of the global heat store, and so should carry the most weight in our assessment of the status of AGW. Observations of ocean heat uptake represent the crucial experiment — observations capable of decisively dismantling a theory despite its widespread acceptance in the scientific community. The ARGO project to monitor ocean heat with thousands of drifting buoys is the crucial experiment of the AGW stable. A number of climate bloggers have remarked on the very low rate of ocean heat uptake (here, and here, and here), much lower than predicted by the models (here, here, and here). The last link is about Nic Lewis, a coauthor on Otto et al. 2013, who feels that recent findings of low climate sensitivity, many based on ocean heat content, have lead a number of prominent IPCC authors to abandon the higher estimates of climate sensitivity. That may not be a ‘catastrophe’ for the dominant AGW paradigm, but it is certainly a lurch by insiders towards the lower ends of risk and urgency. The IPCC panel preparing the AR5 report may not have been devastated when they changed the likely range of climate sensitivity, which had stood at 4.5–2°C since 1990. The lower extimate has now been dropped from 2°C to 1.5°C. What has not been appreciated is that increasing the range of uncertainty is impossible in a period of Kuhnian ‘normal science’, where new information always decreases uncertainty. The ‘blow-out’ in the range of likely climate sensitivity can only mean one thing: We are no longer in a period of ‘normal’ science, but entering a period of ‘paradigm shift’. Until the scientific revolution, explaining away anomalous results will be the normal behavior of the status quo. For example, Nic details a series of erroneous statements and misrepresentation by the UK Met Office of peer-reviewed studies observing relatively modest aerosol forcing and climate sensitivity (here and here). What new theory could possibly replace the dominant paradigm? Clearly there is a great deal yet to know about natural climate variation and the influence of the Sun on global temperature and climate. While many studies have found a strong correlation between the sun and climate, other studies have discounted a strong solar influence. I personally think that miss-specified models have contributed dismissal of solar influence, and have developed an alternative ‘accumulative’ theory of solar influence (here, here and here). 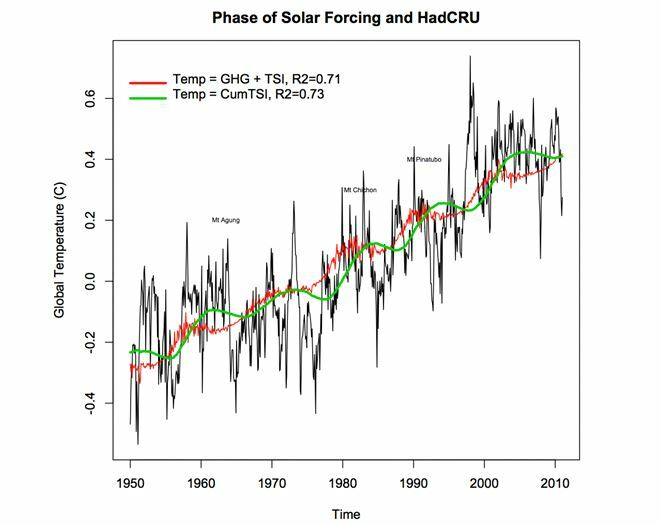 UC Berkely professor Richard Muller has said, “Anyone claiming another cause would have to show that it correlates with the temperature record at least as well as CO2.” As shown in the figure above, a simple regression model of accumulated total solar insolation (CumTSI) with global temperature gives a higher correlation than greenhouse gas and total solar insolation. In large part this is because accumulation shifts the phase of solar effects by 90 degrees bringing it into phase with global temperature, even though the pattern is obscured by the timing of major volcanic eruptions last century. In the accumulation theory, global temperature rises while solar activity is above the long-term solar constant. It is an immature theory, admittedly, but it works over annual- to million-year time scales and explains some very specific features such as ‘chaotic’ dynamics, 20th century warming and the current ‘pause’. Climate skeptics don’t want to say we told you so but, well, we told you so. Even though we do not yet have an accepted theory of solar influence, there are 25 unique models in the AR5-sponsored CIMP5 archive, most with a climate sensitivity untenable on observations from the last decade. 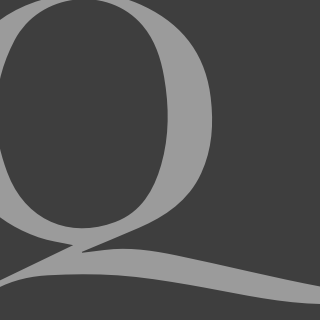 Take out Occam’s razor and cull them – deep and hard. Has anyone written a reply to Ian Plimmer’s book “Not for Greens”. It seems to have a fairly plausible argument against global warming. Or is he just another climate change sceptic ?